Auburn University’s Southeastern Raptor Center will release an adult bald eagle Saturday, Nov. 10, at Mt. Cheaha State Park in Delta, Alabama. The release is open to the public and will take place at 10 a.m. on the back deck of the park restaurant. This eagle was found at Anniston/Calhoun County Regional Airport, grounded and unable to fly. It was taken to the Alabama Wildlife Center in Pelham, Alabama, and was transferred on June 27 to the Southeastern Raptor Center, where it received a thorough medical examination. Radiographs showed the eagle had a fractured coracoid in its left shoulder. After several weeks of healing and rehabilitation, the eagle is now fully recovered and has regained full flight capabilities. Details about the case, including care of the eagle, are available on the raptor center website. A map to the release site is available online. Auburn University’s Southeastern Raptor Center will release an adult bald eagle Saturday, Nov. 10, at Mt. Cheaha State Park. 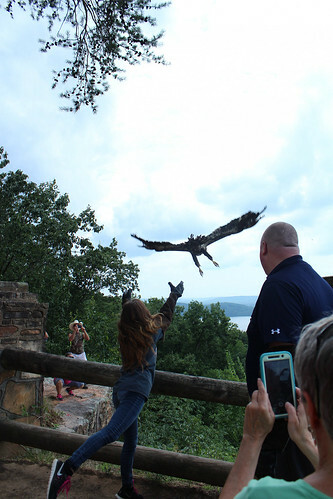 Pictured is a 2016 eagle release.